Meet local mother and daughter duo behind Gadbois Jewelry, exclusively available at Roger’s Gardens on Friday, March 22 from 10 a.m. to 4 p.m. Industry veteran, Frances Gadbois, and daughter and co-founder, Charlotte, created a fresh and vibrant, luxury jewelry line with classic and wearable staples. Their signature strié texture runs through each hand finished piece. With something for everyone, Frances and Charlotte, have combined their elegant design expertise and modern flare to build a versatile jewelry collection that can be worn to yoga or out on the town. 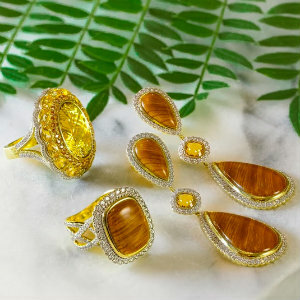 The collections range from dainty giftable diamond pendants or ring stackers, to statement cocktail rings showcasing their rare, luxurious semi-precious gemstones.